Designed by Ralph M. Unger in 2007. Published by Profonts. Sonata Pro and Concerto Pro are closely related to each other. In fact, the only difference between the two related fonts is in the upper-case characters. 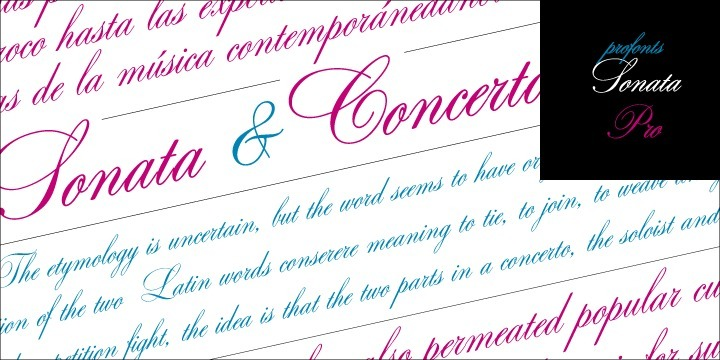 The Concerto Pro upper-cases characters are more complex, swashier than those in Sonata Pro. One is a perfect complement to the other. Both fonts contain about 1200 glyphs covering the complete Latin set for Western and Eastern Europe. Additionally, there is a large selection of alternates and ligatures to make this beautiful script design a perfect font for OTF-savvy applications. Sonata supports up to 77 different languages such as Spanish, English, Portuguese, German, French, Turkish, Italian, Polish, Kurdish (Latin), Romanian, Dutch, Hungarian, Kazakh (Latin), Serbian (Latin), Czech, Swedish, Belarusian (Latin), Croatian, Finnish, Slovak, Danish, Lithuanian, Latvian, Slovenian, Irish, Estonian, Basque, Luxembourgian, and Icelandic in Latin and other scripts. Frankly, I’d like to see the government get out of war altogether and leave the whole field to private industry.